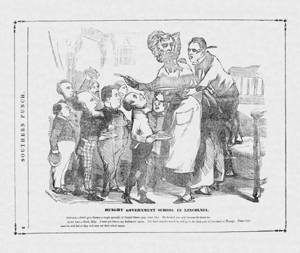 In this cartoon from pro-Confederate Southern Punch, President Abraham Lincoln is a public school cook distributing federal patronage in order to prevent supporters from supporting the Democrats (“Chicago”) and Radical Republicans (“Cleveland”) during the 1864 election. Secretary of State William Henry Seward tries to prevent Lincoln from feeding New York Tribune editor Horace Greeley, who in 1860 helped Lincoln defeat Seward for the Republican presidential nomination. Here, Greeley looks up in anticipation from under the arm of Lincoln. The man wearing checked pants is intended to be James Gordon Bennett Sr., owner-editor of the New York Herald. In the back of the group, Attorney General Edward Bates pushes forward his plate, under which may be John C. Fremont, who ran for president on the Radical Republican ticket before dropping out of the race in late September.